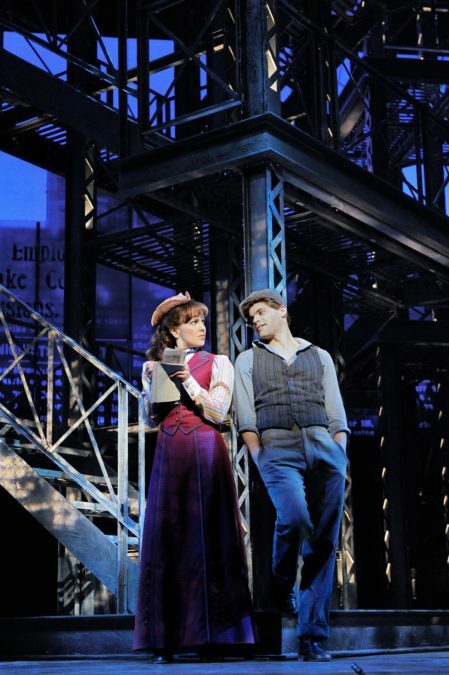 Will Jeremy Jordan & Kara Lindsay Return to Newsies? Jeremy Jordan and Kara Lindsay might seize the day for the camera! There's speculation that plans are in place to film the national tour of Newsies during its Los Angeles engagement, and the Broadway.com Audience Choice Award-winning duo are set to reprise the roles they created on the Great White Way for the filming. The tour of the Disney musical is scheduled to play L.A.’s Pantages Theatre from August 30 through September 4. Jordan and Lindsay would temporarily assume the roles of Jack Kelly and Katherine, respectively, from Joey Barreiro and Morgan Keene. Jordan received a Tony nomination for his performance in Newsies and has gone on to appear on screen in The Last Five Years and Supergirl. After making her Broadway debut in Newsies, Lindsay stared as Glinda in Wicked—during which time she grabbed a camera for Broadway.com’s vlog Think Pink. Featuring a Tony-winning score by Alan Menken and Jack Feldman and a book by Harvey Fierstein, Newsies follows Jack Kelly, a charismatic newsboy and leader of a ragged band of teenaged "newsies," who dreams only of a better life far from the hardship of the streets. When publishing titans Joseph Pulitzer and William Randolph Hearst raise distribution prices at the newsboys’ expense, Jack finds a cause to fight for and rallies newsies from across the city to strike for what’s right. The musical is directed by Tony nominee Jeff Calhoun and choreographed by Christopher Gattelli, who won a 2012 Tony Award for his work. The score includes such songs as "Santa Fe," "Carrying the Banner," "Seize the Day," "King of New York" and "Once and for All."